This project is a collaboration between two Inria teams (Asclepios and Shacra team). These simulations are based on SOFA, the simulation software developed at Inria. The electrophysiology is the physiology from the cardiac electrical activity. In other words, the electrophysiology corresponds to the propagation phenomenon of an electrical wave through the walls of the heart (called endo-, myo- and epicardium). In our simulations, the electrophysiology is described by differential equations using phenomenological models. However, other models exist such as biophysical models or Eikonal models. What is an arrhythmia ? An arrhythmia characterizes any abnormal electrical activity of the heart. Arrhythmias may be classified by rate (normal, tachycardia, bradycardia…), or mechanism (automaticity, reentry, fibrillation…). Furthermore, arrhythmia can occur in different regions of the heart: in an atrium, a ventricle or at the junction between atrium and ventricle. In the next decades, the current statistics foresee an significant increase of patients suffering from cardiac diseases in developed countries. This can be explained by the fact that patients over 65 years old are prone to cardiac diseases while population is ageing. Moreover, it is planed that in 2020 cardiac diseases will match about 40% of all diseases. As a result, the cardiology is going to become one of the major field in medicine. As a consequence, health organizations will need to increase the workforce in cardiology. The coming need of new cardiologists implies to training these cardiology-trainees. This introduces the issue of the methods of training. Till now, all cardiologists are trained directly during the operations. Only very few basic simulator for catheter navigation do exist. 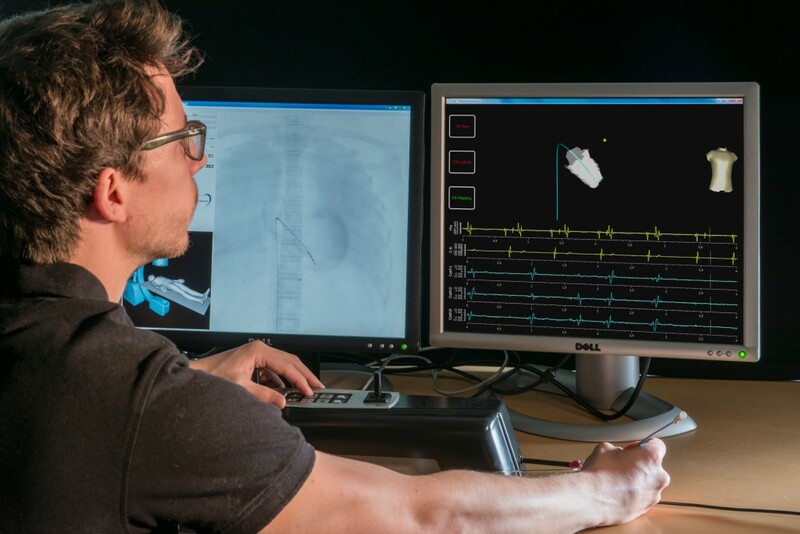 My Ph.D. first proposed to develop a new training system able to simulate cardiac thermo-ablation in real-time. Such a simulator would enable the cardiology-trainee to first train on simulators before operating patients. This therefore aims at improving the training of the cardiologists. A prototype has been built at the end of my Ph.D. and is presented in details in a video available here. This work rises to a second challenge: adapt our numerical model in order to reproduce the cardiac electrophysiology of a specific patient with a high level of accuracy. This is called a patient-specific personalization. 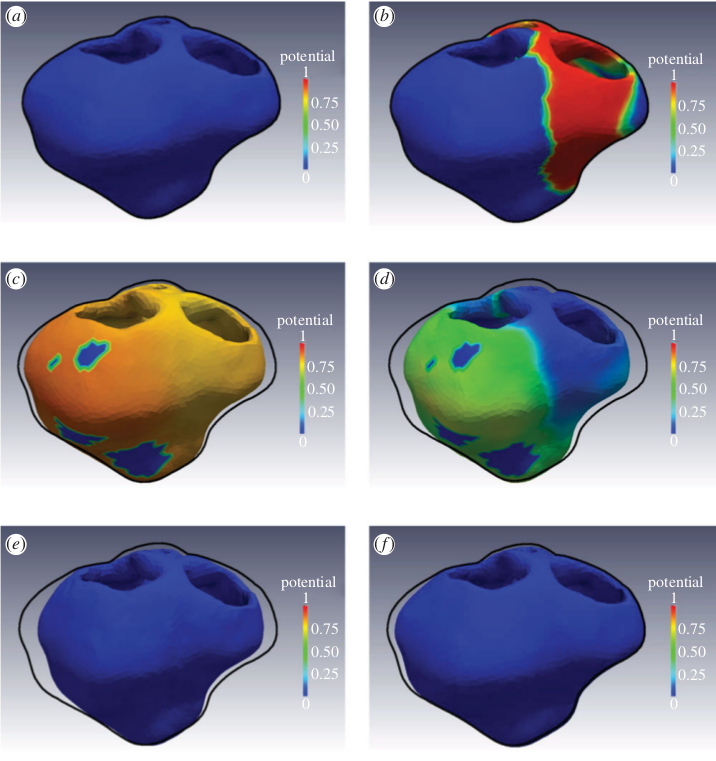 A high fidelity model of the patient electrophysiology would allow the clinician to test pre-operatively different treatments (different choices of ablated regions) using simulation. Such a predictive tool would be extremely helpful for cardiologists. Do not hesitate to contact me for any additional information.